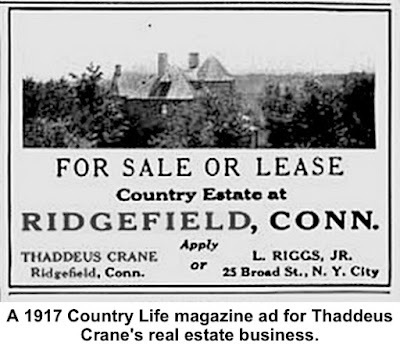 something quite different from selling homes and insurance: Mr. Crane may have had the most spectacular death of any Ridgefielder in the 20th Century. 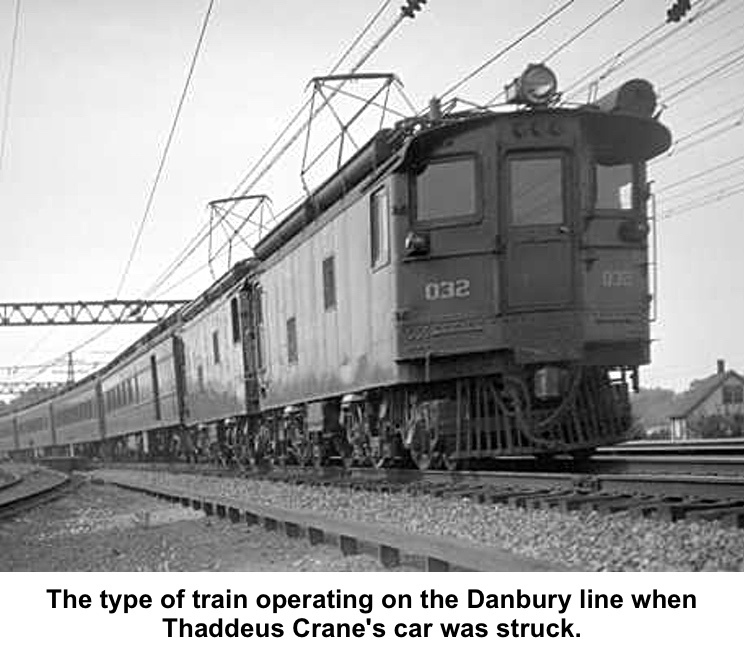 In May 1928, for reasons unknown, Crane drove at high speed onto a railroad crossing in Wilton where a northbound train, “whistle shrieking,” smashed into his Hudson sedan and hurled it into the air. The car exploded, crashed into the second locomotive, bounced through the air into the baggage car, and flipped off into a trackside signal box, which also exploded. Witnesses risked their lives to drag him from the burning car, but Crane died within minutes. Typical of fatal automobile accidents of the era, The Ridgefield Press devoted more than 20 column inches to details of the crash, but only two inches to his life. After schooling at an academy in Norwalk, Crane became a farmer and, in 1891, married Mary Lent Brown. In 1896 the couple moved to Ridgefield where they had a farm off South Olmstead Lane, and raised two daughters and a son. 1920 he was one of only three real estate agents in a town that now has a hundred active Realtors; the other two were M. Estelle Benjamin and William R. Keeler. 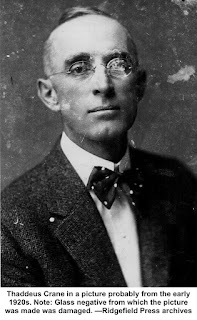 Crane was well known in the community, serving on the school board in the 1900s and 1910s. He was a founding member of the Promoter’s Club, a predecessor of the Ridgefield Chamber of Commerce, and belonged to the Jerusalem Lodge of Masons. Active in St. Stephen’s Church, he was a member of the vestry when the parish built its new stone church in 1915. How did Crane manage to enter a railroad crossing whose warning lights were flashing and where the train was both visible and loudly sounding its whistle? 33 near Route 7. A bridge now brings 33 over the tracks; back then, the road crossed the tracks. “Mr. Crane was driving a Hudson super-six sedan,” the account said. “The machine was going across the railroad tracks at a fairly good clip when it was struck. 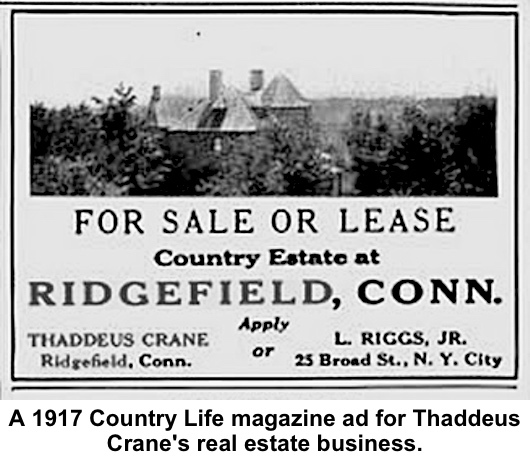 Two years after his death, Mr. Crane’s business was sold to Arthur J. Carnall, and operated under the name, A.J. Carnall Inc. for decades. In 1999, Ridgefield Bank, now Fairfield County Bank, bought A.J. 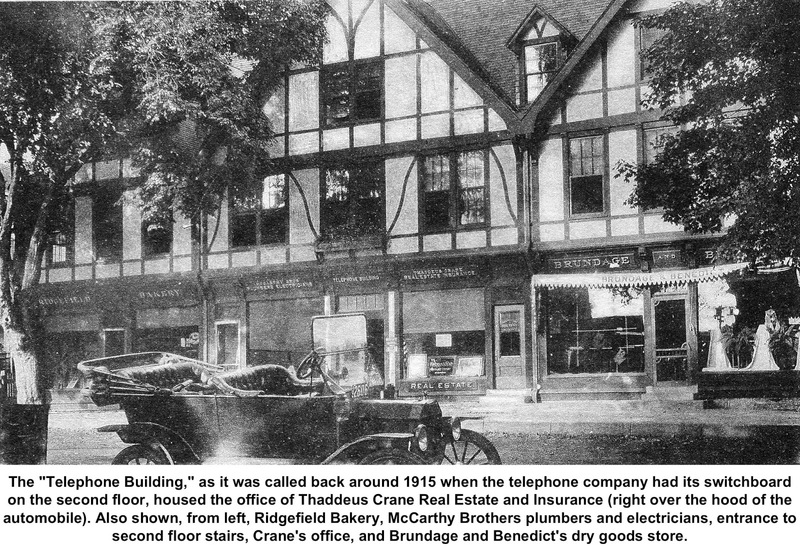 Carnall Inc., and 10 years later renamed it Fairfield County Bank Insurance Services. 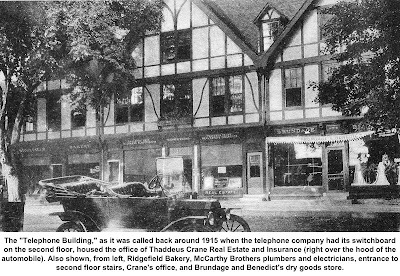 It’s still headquartered in the “Carnall Building” at the corner of Main and Catoonah Streets.